This ship, Matson's second Mariposa, was originally a cargo carrier named Pine Tree Mariner. Built for the U.S. Maritime Commission by Bethlehem Steel Co., Quincy, Massachusetts, Pine Tree Mariner was launched in November 1952 and entered service in 1953. In 1956, the ship was sold to Matson Navigation Co, converted into a passenger ship at Willamette Iron and Steel Corp., Portland, Oregon, and renamed Mariposa. 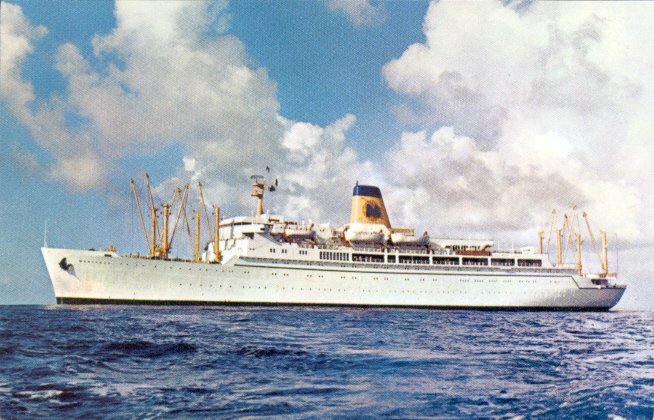 Her maiden voyage for Matson was from San Francisco to Sydney, by way of Honolulu and Auckland, on 27 October 1956. In 1971, Mariposa was sold to Pacific Far East Line, Inc., which used her for Pacific Ocean cruises. Laid up in 1978, she was sold to World Airways, Inc., in 1979 and was towed to Japan in November 1980. After her January 1981 arrival in Japan, she was again laid up and later the same year was returned to Pacific Far East Line. In 1983, she was sold to China Ocean Shipping Co., renamed Jin Jiang and placed on a Shanghai-Hong Kong service. In early 1996, under the name Heng Li, the ship went to India for breaking-up. Sources: Kludas' Great Passenger Ships of the World; Kludas' Great Passenger Ships of the World Today; Knego's The World's Passenger Fleet CD.